the bail/bond will be forfeited and the defendant and or surety may be ordered to pay that amount of the bond. Any restitution, recompense, fines, forfeitures, or cost imposed against the defendant shall be paid out of the cash bail/bond without further notice. 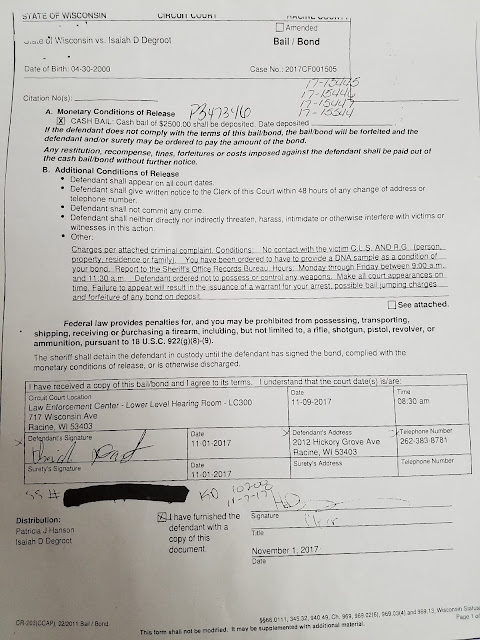 Anyone wish to dispute Degroot violated bail/bond? The derelict and negligent Racine County Circuit Court system bears great responsibility of the damage caused by Isaiah DeGroot, a known criminal who was released with low bail back onto the streets to create more mayhem. Nor does the sheriff's office whose lazy staff denied access of Degroot for risk assessment. 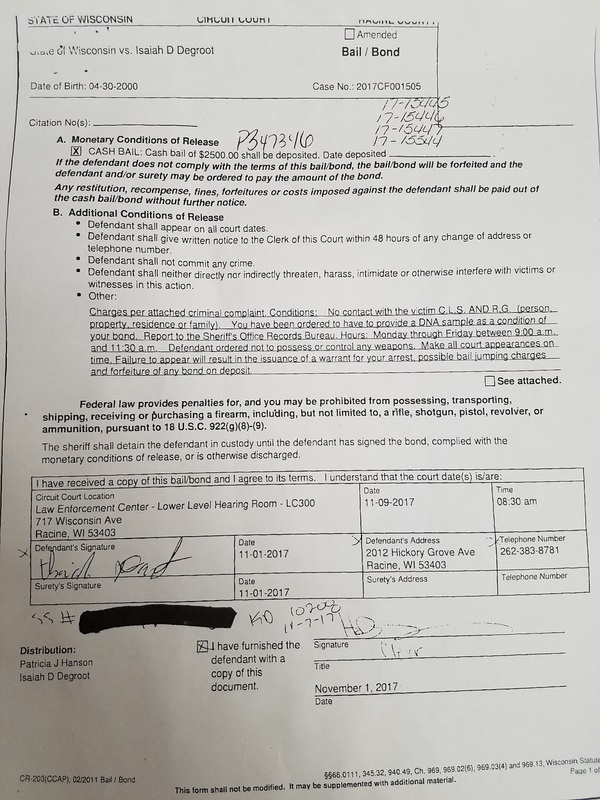 The surety bond of $3,000 should be immediately called in and the proceeds of that surety bond be delivered to the couple who have paid the highest price of DeGroot's continued criminal rampage. Listed below are the Racine County officials responsible for the Degroot court fiasco. This letter is do to your derelict and egregious conduct as public officials handling case 17CF1505. Each of you have failed to properly review the case at hand and further failed to place the safety of the public as a high priority. I demand that Racine county turn over the Surety bail/bond of Isaiah Degroot to Jeff and Cheryl Coopman as partial recompense of their destroyed lives.